First, we would like to say that our hearts go out to everyone in North Carolina and the surrounding states who have been affected by Hurricane Florence. The entire Ray Pest Control team wishes everyone in our Piedmont community and beyond the very best as we recover, rebuild, and heal in the days, weeks, and months to come. In light of the tremendously tragic events our communities have suffered in the last few weeks, we thought we would take this opportunity to lighten our readers’ moods by offering a bit of humor in the middle of such overwhelming devastation. After all, laughter is good for the heart and soul. With Halloween only weeks away, we thought we’d have a little fun today by looking at some of the most memorable spiders in film. And remember, when you need a professional pest control company to handle your spider problem — no matter how big or small — you can count on Ray Pest Control. This 1990 thriller/comedy gave adults and children nightmares and still does to this day. After a nature photographer from Small Town U.S.A. dies while on assignment in the rainforest of Venezuela, a poisonous, spiteful spider hitches a ride to this small town in the photographer’s coffin. Upon arrival, the spider immediately mates with a standard house spider, creating a spawn of spiders hell-bent on terrorizing the people of this small community. The hero character played by Jeff Daniels, along with the brazen, fearless bug exterminator played by John Goodman, save the day by eliminating the deadly spider infestation. This is a classic man versus nature film with a twist, sprinkled with a dash of dark comedy. Shelob is the giant man-eating, orc-gorging spider who we learn about in The Two Towers, but who finally makes her appearance in The Return of the King. The creature Gollum wants to get the One Ring (the Ring of Power) from Frodo Baggins, the brave and loveable Hobbit, who has volunteered to carry the ring into Mordor to destroy it in Mount Doom, which will save all of Middle-Earth from peril at the hands of the evil Lord Sauron. Shelob is utterly terrifying when she attempts to kill poor Frodo when he attempts to pass through her lair in Cirith Ungol under the direction of the conniving Gollum. After she stings Frodo and poisons him, she wraps him in her web and then leaves him for a time. Frodo is quickly found by his loyal companion, Samwise Gamgee, who saves Frodo’s life by fighting the beast and severely injuring her, leaving her to creep back into her dark and deathly lair with an empty belly. Shelob’s character is much more developed and complicated in the book series, although her presence in the film was truly outstanding. Aragog belonged to Rubeus Hagrid, the beloved half-giant groundskeeper, who looked after Harry Potter since he was a baby. Aragog was only the size of a toy puppy when Hagrid owned him, yet he grew to the size of a small elephant with what is described as an eighteen-foot leg span! What’s the deal with all these giant spiders? For reasons too long to explain in the time we have here, Aragog was forced to flee into the Forbidden Forest surrounding Hogwarts Castle where he and his spider-wife spawned a colony of Acromantula. In the third installment of the series, Harry and his best-pal Ron Weasley are chased down by thousands of giant, hungry, human-hating kin of Aragog. Later, the Great Aragog passes away in the Half-Blood Prince. While Aragog is truly terrifying in size, his relationship with Hagrid gives fans hope that not all spiders are all bad. 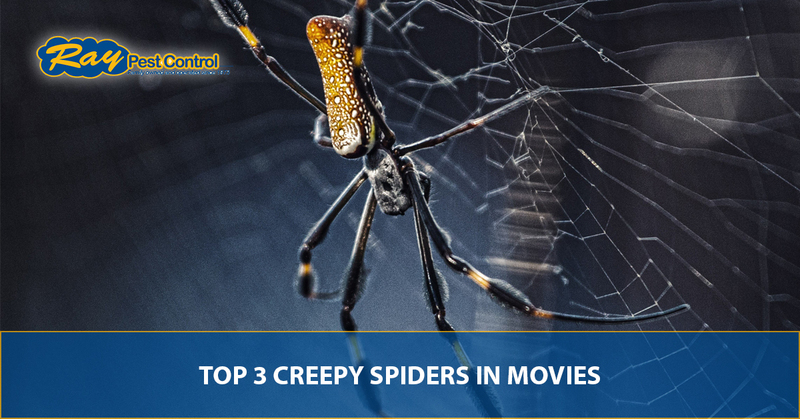 We hope you enjoyed reading about three of our favorite spiders from movies. Should your home ever be taken over by a colony of hybrid poisonous spiders, a giant she-spider, a colony of Acromantulas, or spider species more common to Piedmont, give Ray Pest Control a call. Our Top Rated Local® pest control company used the safest, most effective methods for removing spiders from your home — and we’ll keep them from coming back. From all of us at Ray Pest Control, have a safe and happy Halloween!